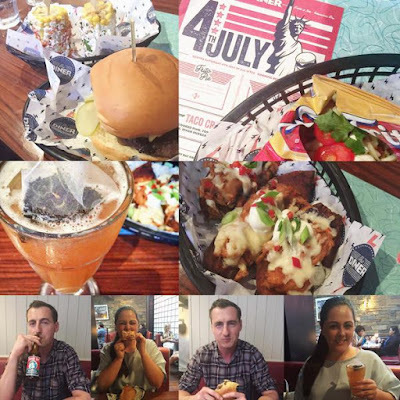 We may be more than 3,000 miles away from our friends across the pond, but Londoners sure know how to throw a good Independence Day party. 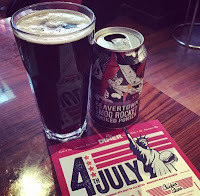 If you're planing to celebrate the 4th July in the capital, The Diner is giving Londoners the opportunity to celebrate in true US style. Leading the celebrations with an original limited edition menu, I couldn't think of any better way to celebrate the US's Independence then with some delicious American meals. 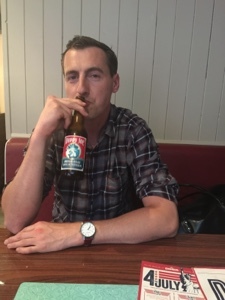 Last night Russell and I visited The Diner in Soho for a preview of their limited edition 4th July menu. 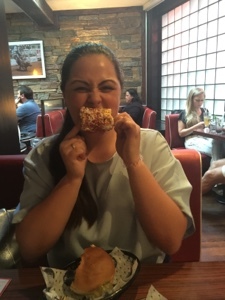 With such delights as BBQ chicken potato skins and s’mores on offer, we knew we were in for a good night. 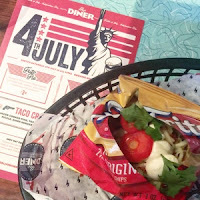 The quintessential Fourth of July starter of 'Frito Pie' was quickly placed in front of us by a very attentive and friendly waiter. Described to us as a classic US tailgate dish, a slashed bag of Frito corn chips was stuffed with beef chilli, sour cream, Jalapenos and coriander. This dish was a real talking point of the evening, and many diners remarked it was the ultimate 'portable nacho' (great for snacking on at a big game). 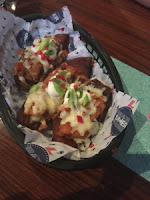 Next we tucked into a plate of potato skins loaded with BBQ pulled chicken and sour cream - this dish was Russell' favourite and I have to admit the chicken was simply delicious. 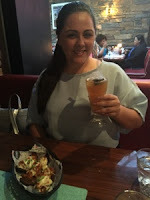 I also ordered a G&T - which is part of the restaurants alcoholic iced tea offering. Paired with the spicy Jalapenos, it was the ideal choice for me as I'm not too good with spice. 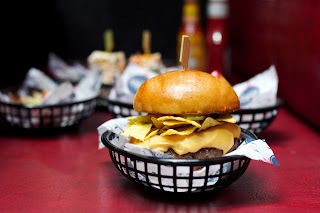 The main included a ‘Taco Crunch’ burger - an 8oz pattie slathered in queso cheese sauce, crispy tortillas, pickles, smoked caramelised onions and topped with The Diner’s infamous burger sauce - accompanied with a side of grilled corn on the cobb. 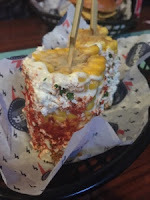 The corn was a real flavour sensation as it was rolled in lime mayo, grated cheese and chilli powder - I'll be trying it at my next BBQ (guests beware!). The evening finished with two S'mores - a true American classic of melted marshmallows layered in chocolate and sandwiched between two crackers. The dessert was small but mighty, and was a rich end to an already flavour packed meal. By the time we decided to go home we were STUFFED. We contemplated ordering a milkshake, but decided our eyes where far to big for our bellies. 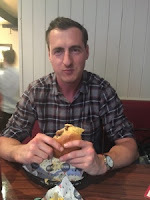 If, like us, you want to order the whole menu it will set you back £28.50 without drinks. Maybe next time they'll create a set menu and throw in a beer (or two?). If you're looking for a place to celebrate on Saturday, look no further for perfect all-American dining. For one day only, the menu will be available in all Diner locations.